Painted by Rembrandt van Rijn, completed in 1642, the painting may be more properly titled by its long since forgotten name "The Company of captain Frans Banning Cocq and lieutenant Willem van Ruytenburch preparing to march out". In the 18th century the painting became known as the "Night Watch". It is prominently displayed in the Rijksmuseum, Amsterdam, the Netherlands, as the best known painting in its collection. 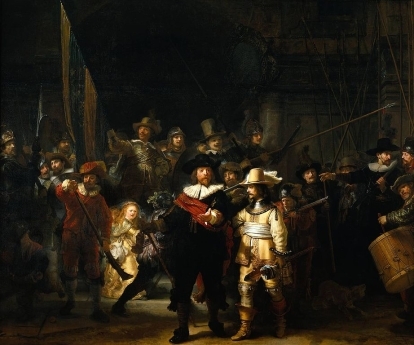 The Night Watch is one of the most famous paintings in the world. It depicts the eponymous company moving out, led by Captain Frans Banning Cocq (dressed in black, with a red sash) and his lieutenant, Willem van Ruytenburch (dressed in yellow, with a white sash). With effective use of sunlight and shade, Rembrandt leads the eye to the three most important characters among the crowd, the two gentlemen in the centre (from whom the painting gets its original title), and the small girl in the centre left background. Behind them, the company's colours are carried by the ensign, Jan Visscher Cornelissen. :source - "http://en.wikipedia.org/wiki/The_Night_Watch": ~ ~ See enactment, below! !